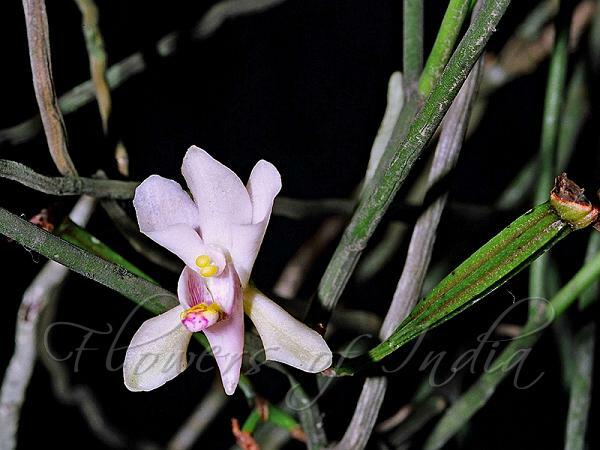 Found in India and Sri Lanka in submontane and tropical wet evergreen forests at elvations around 1500 meters as a large sized, cool growing monopodial epiphyte with a terete, elongate stem carrying several, terete, obliquely truncate-acute, basally claspng leaves that blooms in the winter and spring on lateral, short, 1.12 to 1.4" [2.8 to 3.5 cm] long, cylindrical, spotted, with 2 sterile bracts, stout, 2 to 3 flowered inflorescence with triangular, emarginate, 3 to 5 veined floral bracts and carrying creamish white, fragrant flowers. CAUTION There seems to be 2 distinct species that commonly represent this species, and there are good drawings of each. 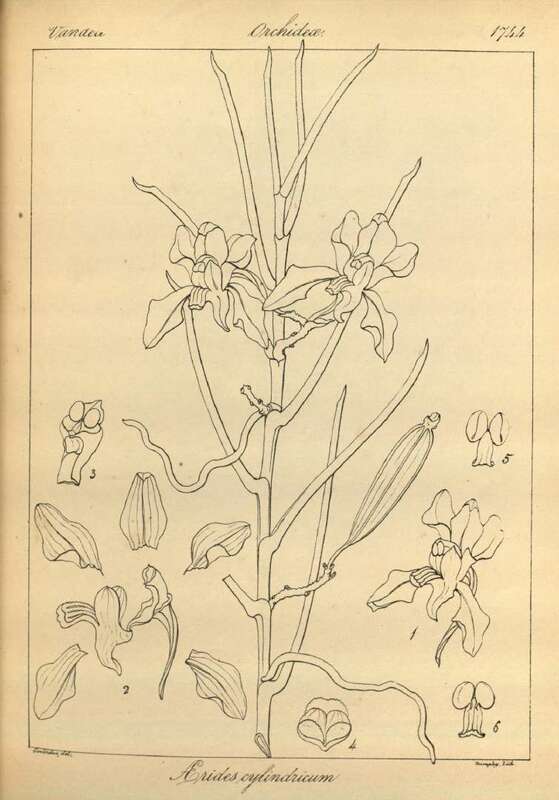 I have not been able to access the original description and drawing so please use with caution. 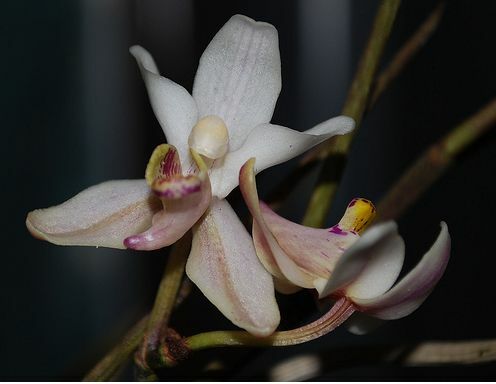 I personally feel that the first photo by Kumar and the drawing by Wight are more likely correct although they are seldom seen with this name in the cultivated orchid world. 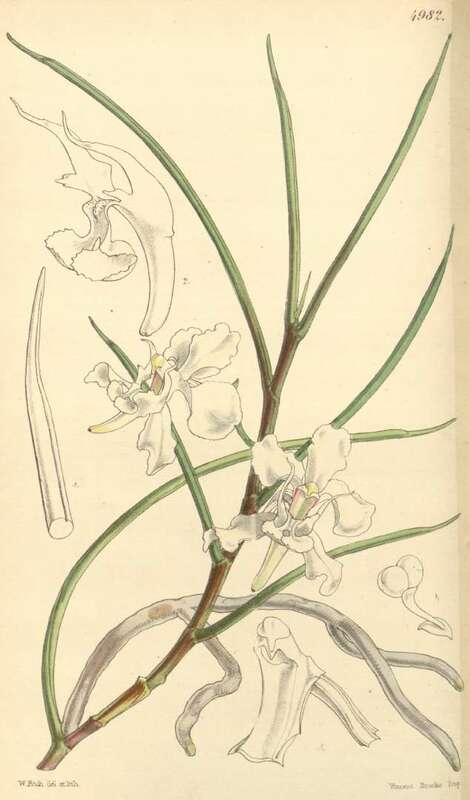 The second drawing from Curtis Botanical Magazine represents what is more commonly seen cultivated as this species but I feel it is actually closer to P biswaiana or P vandarum.